Alciato at Glasgow: Emblem: Invidia. Tela manu, talis pingitur invidia. A filthy woman chewing the flesh of vipers, whose eyes give her pain, who gnaws her own heart, in the grip of emaciation and pallor, carrying prickly sticks in her hand - thus is Envy depicted. 1. Oculi dolent is a proverbial expression, referring to the pain of seeing what one does not like. 2. This description is taken from Ovid, Metamorphoses, 2.760ff., a depiction of the House of Envy. 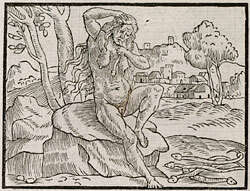 Los Emblemas (1549), Lyon: La invidia. Diverse imprese (1551), Lyon: INVIDIA. Emblematum libri II (Stockhamer) (1556), Lyon: Invidia. Toutes les emblemes (1558), Lyon: ENVIE. Liber emblematum ... Kunstbuch (1567), Franckfurt am Main: Invidia. Verbunst. Les emblemes (1615), Geneva/Cologny: Envie.